Brad and I took one more walk along the Med this morning, wading in the water as the tide came in. We’ve just begun to move out of the summer season here and have witnessed some light sprinkles and blustery skies. This view of the mosque, near where we usually access the beach, was particularly engaging this morning. 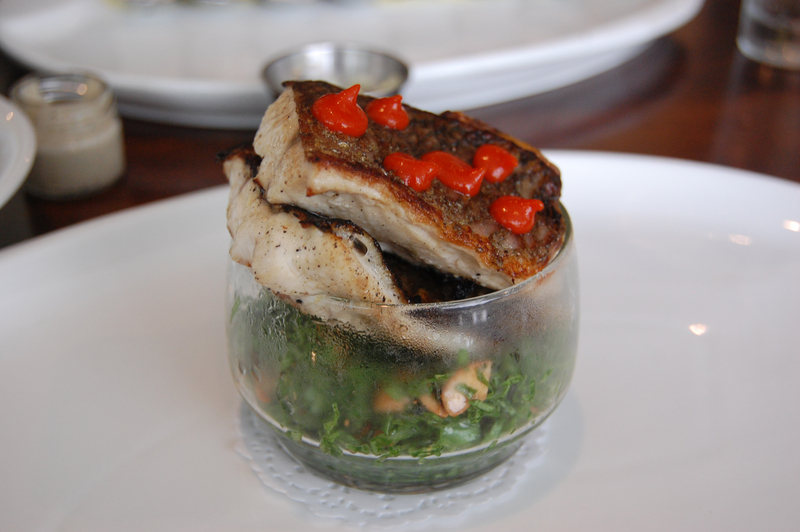 We had lunch at one of the area’s best restaurants, Segev. I must thank Anne for introducing me to this fab establishment, just minutes from our house in Herzliya Pituach. 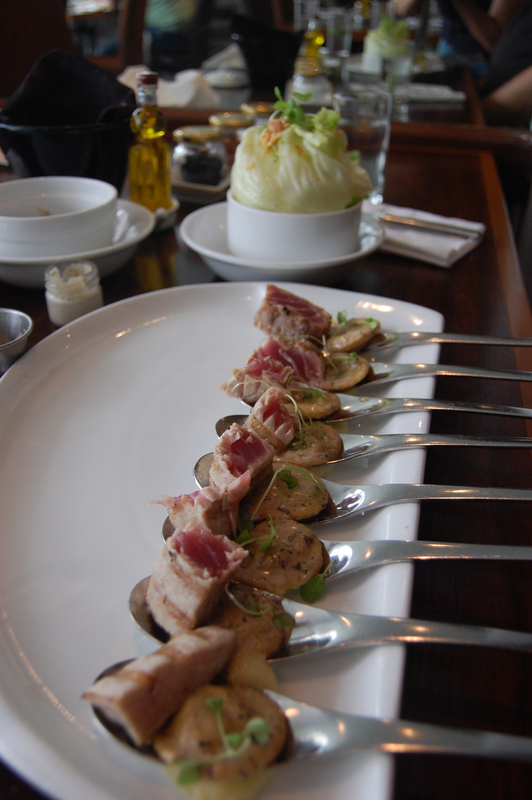 Everything was delicious and served in inimitable style. Today I took a walk to the local convenience store to pick up a copy of the Friday newspaper. It’s become a ritual for us since we moved to Israel—to get the Friday paper. The Friday paper is like the Sunday paper back home (though a lot thinner over here!). It’s the one with event and cultural listings, supplementary magazines, and TV guide. There are two major English-language newspapers here and we opt for The International Herald Tribune—it’s the international version of The New York Times with the local newspaper supplement the Ha’aretz and, most important of all, the New York Times crossword puzzle. I decided to bring my camera along with me for the walk, just like I used to do when we first moved here. Back when Herzliya Pituach was unfamiliar territory and I never knew what interesting phenomenon I might come across. Since I now have my own car, and especially since it is so hot out these days, I haven’t been walking through the neighborhood much lately. But I wanted to walk today despite the weather. We will be moving back home shortly (the first week in October) and I’d like to savor the sights in the neighborhood. The incredible lushness of the vegetation, the quirky and sometimes—no oftentimes—over-the-top architecture. And maybe I’d come across a hoopoe or two. Well, no hoopoe sightings today…just scads of hooded crows. 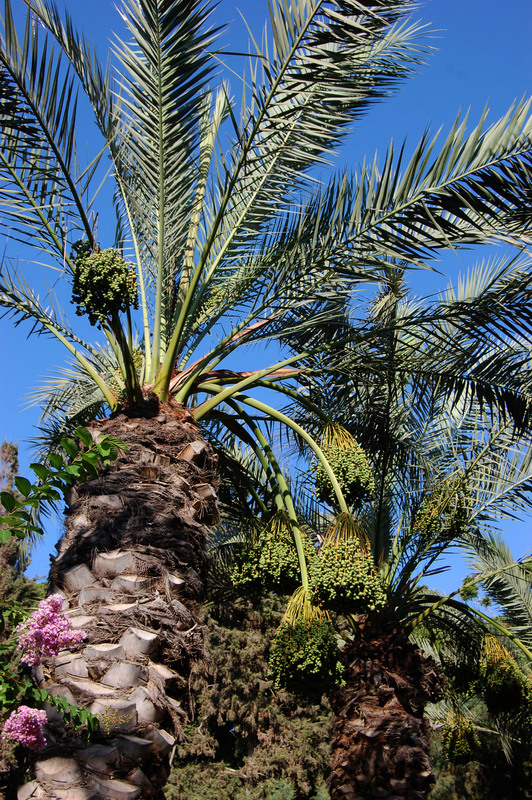 I sat for awhile in Vriesland Garden and noticed the palm trees were laden with dates. These are a different kind of date than the medjoul dates I buy in the grocery store. 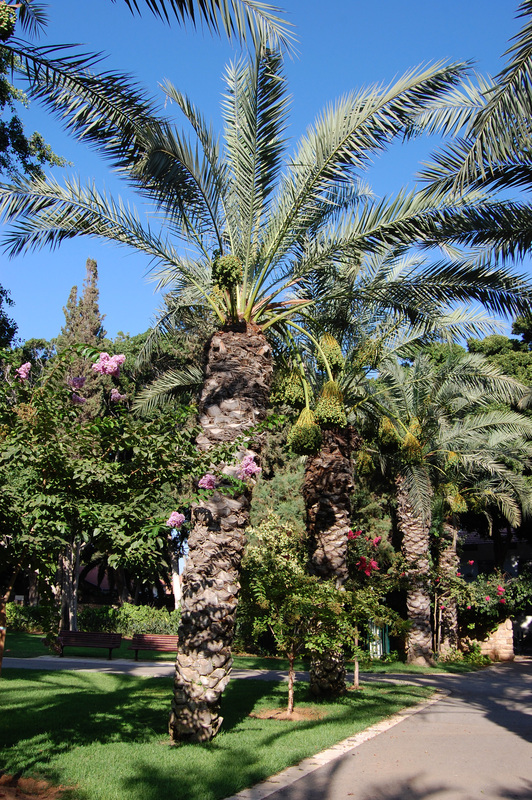 There are plenty of these date palms throughout the Tel Aviv district just like the ones in Vriesland Garden. All simply bursting with dates right now. I wondered last year what the city and municipalities do with all the dates and never found an answer to the question. I’d love to find the answer to that question before we move. The long weekend for Martin Luther King Jr.s birthday provided the perfect opportunity to head south for a two-night stay in Ein Gedi, situated near the Dead Sea and just north of Masada. There’s not much in Ein Gedi save the Ein Gedi Kibbutz Resort Hotel, where we stayed, and the Ein Gedi Nature Reserve. Oh, and I mustn’t forget the Ein Gedi Spa run by the Kibbutz Hotel and the public beaches on the shores of the Dead Sea. The Ein Gedi Kibbutz, founded in the mid-195os, is a sprawling complex comprising a variety of accommodations, residences and facilities for the kibbutzniks, a swimming pool, a cactus garden, a couple of dining facilities, and, making the most of its situation in the proverbial oasis in the desert, a botanical garden featuring plants and trees from all over the world. It was an interesting journey from Tel Aviv, west through Jerusalem and then south along the Dead Sea and through the West Bank. The scenery changed dramatically as we approached our destination and we passed many interesting sights along the way. Our accommodations in the “deluxe” rooms were clean and comfy, though not as luxurious as you would expect from a European deluxe hotel room. 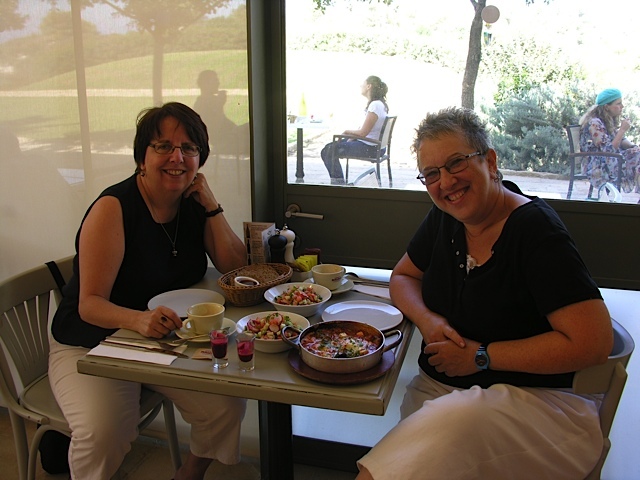 The food at the dining facilities was quite good and we enjoyed exploring the botanical garden and the views from different areas of the kibbutz. We spotted a caravan of camels along the Dead Sea. Ein Gedi Nature Reserve as viewed from our patio. A Nubian Ibex from the nature reserve next door has come for some nibbles in the kibbutz botanical garden. Tags: "Ein Gedi" kibbutz Ibex "Botanical Garden"
I’ve been admiring the many gorgeous bougainvillea plants in our neighborhood, most of which are adorned with copious blooms* of brilliant color. Imagine my surprise when the ugly duckling of a plant in our front courtyard began to sprout delicate but radiant flowers. 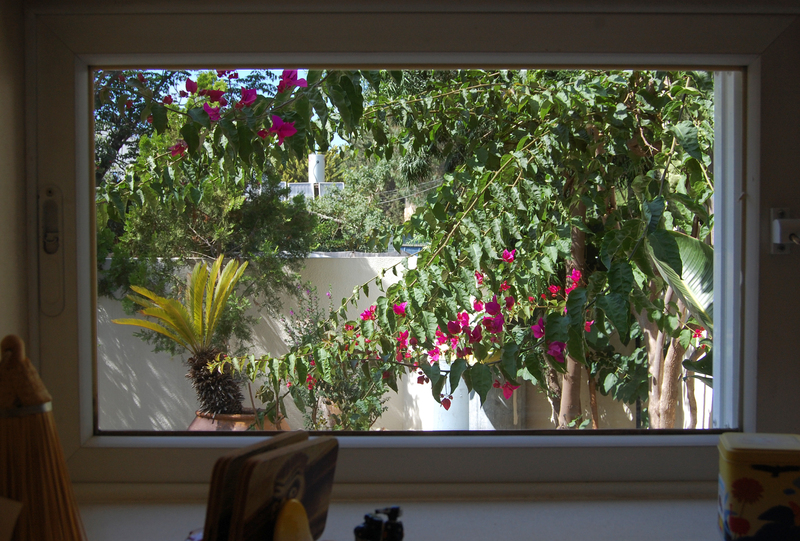 Why, we have our own bougainvillea bush! I call it an ugly duckling of a plant because only until its recent metamorphosis it appeared as a gangly, sorry sort of plant that had managed to grow tortuously in and around the bars of our garage window. 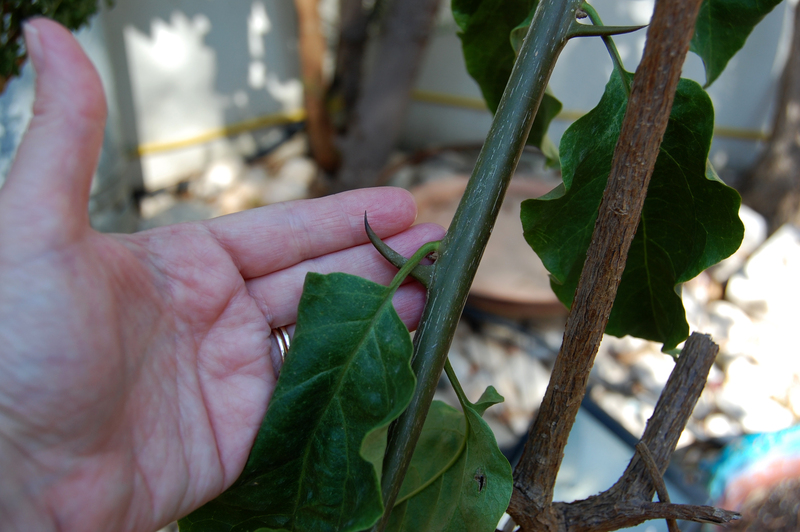 The branches sport deadly sharp thorns. Pruning the thing required the utmost care to prevent the drawing of blood. But with these unexpected blooms the plant is suddenly a beauty. We probably need to do more pruning to really let the plant come into its full potential. But in the meantime more and more colorful blooms keep popping out. *as explained in an earlier post, not really flowers but specialized leaves called bracts. As seen from outside the house. 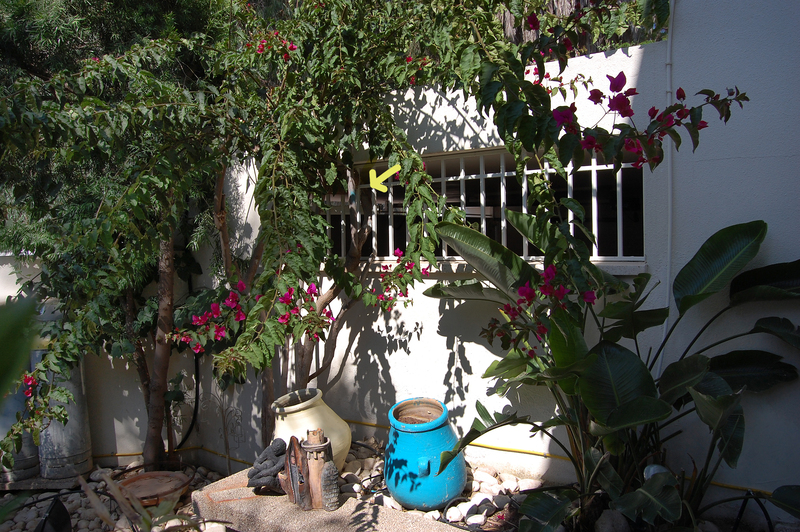 The arrow points to where the plant has grown in and around the bars of the garage window. Shrine of the Bàb on the central terrace of the Bahai Gardens in Haifa. Click image to see more photos of the Gardens. 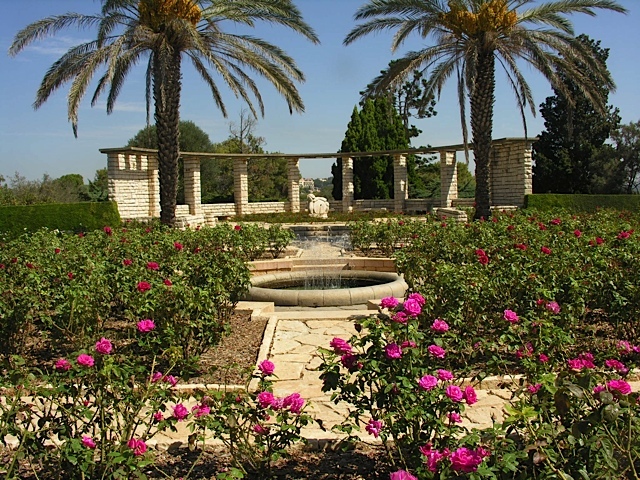 I’d never heard of the Bahai Gardens before we moved to Israel but since arriving whenever I’ve heard the Gardens mentioned the speaker’s tone of voice is invariably one of profound reverence. B and I decided to visit the Gardens yesterday. They’re located in Haifa, just one hour north of us, a straight shot up Route 2. 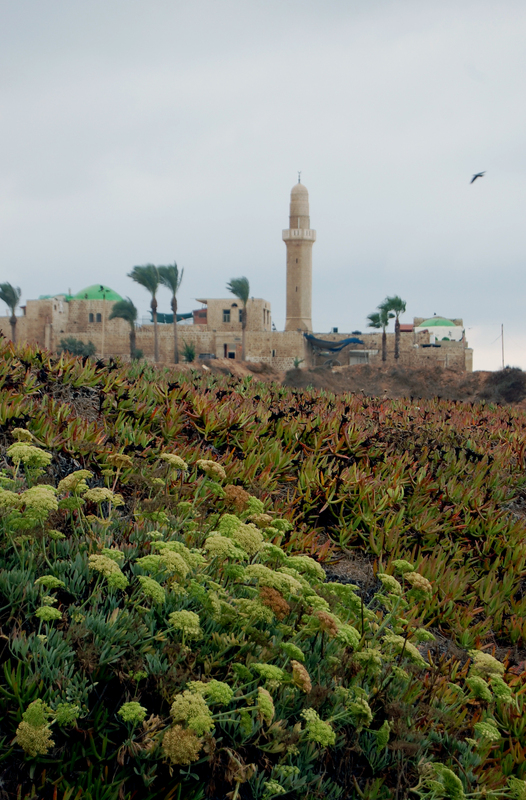 The Gardens, the work of members of the Bahai Faith, consist of nineteen terraces that extend one kilometer down the north slope of Mount Carmel into the heart of Haifa. The central terrace is the largest and it is there that the Shrine of the Bàb is located. The Bàb is a central figure in the Bahai Faith, a monotheistic religion founded in mid-nineteenth century Persia. Their leader was executed by the Persians and his successor was driven into exile in Akko, just north of Haifa. The design of the Gardens is intensely symbolic of principles of the Bahai Faith, some of which are unity of humankind, equality between men and women, world peace, elimination of all forms of prejudice. Bahais believe in one God who has sent various messengers throughout the ages: Abraham, Mohammed, Buddha, Krishna, Jesus and, of course, the Bàb. The tour of the Gardens starts at the topmost terrace. We decided to park our car at the bottom at Colony Plaza and took a cab up to the top. Entrance to the Gardens is free but there is limited access unless you take one of the free tours. Even so, with the tour we only got to walk down half the terraces and arrived too late for entrance into the Shrine of the Bàb. I now understand the reverence of those who have already seen the Gardens. They are immaculately tended, gorgeous to behold, a pure work of art. The colors of the blooms, the landscaping, the waters that run along either side of the path — all elements of the design were exquisitely devised. I would love to someday have time to wander the Gardens on my own; they seem to beg for solitary reflection. That is impossible, however, when one is a member of a group of some 65 tourists with another group just as large right on your heels. It occurred to me that the Gardens are the Bahai’s version of a cathedral and I absolutely love that concept. Read more about the Gardens, their design and symbolism here. When the tour was over we exited from the Central Terrace and took some decidedly less scenic steps down to Colony Plaza. I’m told in all there are 1,700 steps from top to bottom. Granted, walking down steps is much less strenuous than walking up but today my calf muscles are screaming at me. After our tour of the Gardens we strolled through the German Colony, an area originally colonized by the German Templers. 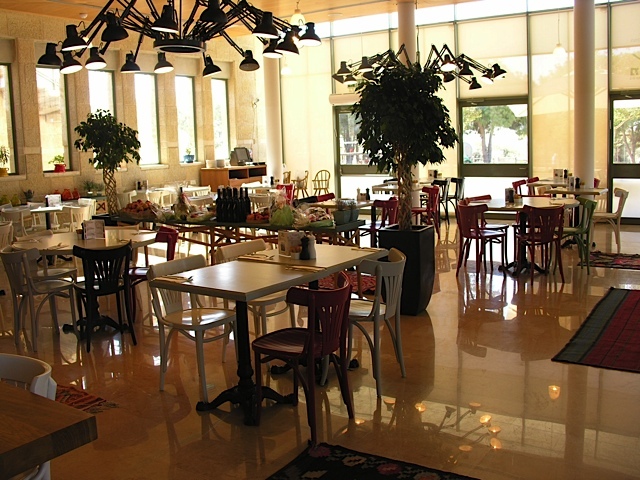 Nowadays the Colony is dotted with cafes, restaurants and boutiques and has become the center of nightlife in Haifa. We had lunch in a pleasant middle eastern restaurant called Fattoush. By the time lunch was done we were both bushed. The hot sun and the long walk down the slope of Mt. Carmel had done us in.